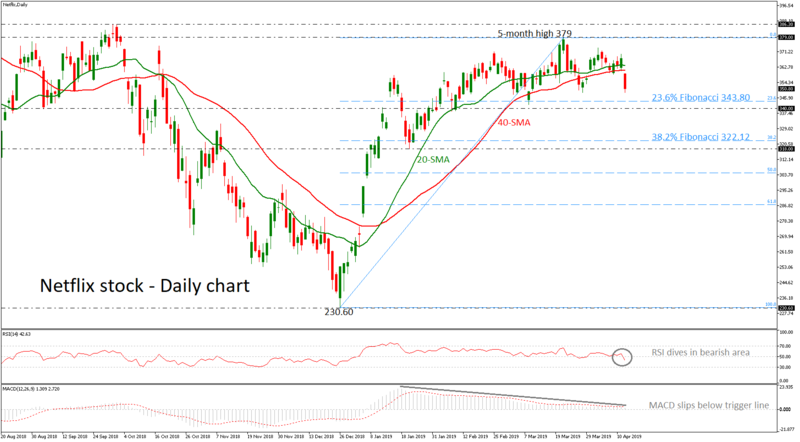 Should the market extend losses, support could be met between the 23.6% Fibonacci retracement level of the upleg from 230.60 to 379, around 343.80 and the 340 barrier. A significant leg below this area could send prices towards the 38.2% Fibonacci of 322.12. On the flip side, if the pair bounces up, immediate resistance could be met at the five-month high of 379 ahead of the 386.30 obstacle, taken from the highs on October 2018. A jump above these lines would endorse the short-term bullish bias. In the bigger picture, the stock is positive as long as it holds above the 20- and 40-week SMAs, around 329 which are ready to create a bullish cross. In case it violates this cross, bears could take the upper hand.